Casa Campana combines two of the most important factors for a multi-generational family vacation: spacious design and a convenient location. There’s tons of common areas for you and your family to relax in, but each of the bedrooms are comfortably sized and spread out. One of the suites has a queen bed and two lofted twins, perfect for a couple with young kids. There’s also a guest house that’s totally independent, but not far from the main space. Casa Campana is in Los Suenos, which is a gated community with a ton of restaurants and activities within a short drive. Located in the Los Suenos Resort! 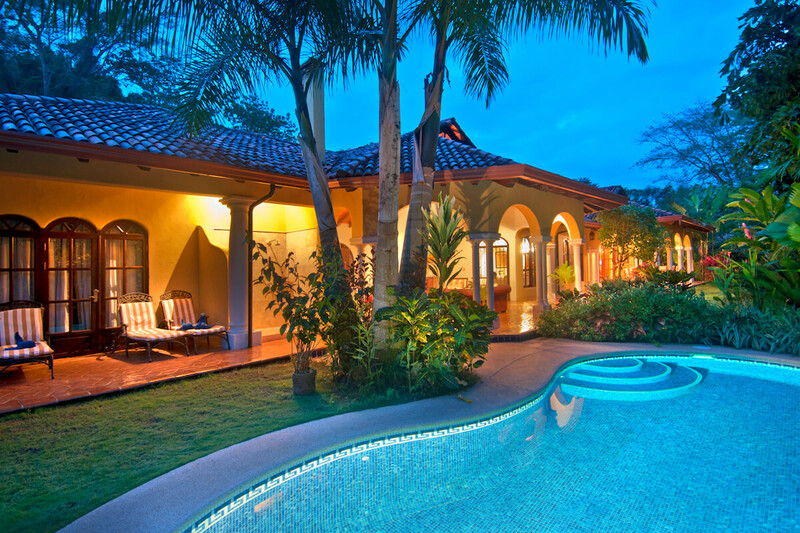 Casa Campana is nestled on a residential road in Los Suenos, a gated community with a golf course. Colonial-inspired design combines with an open layout and tropical landscaping at this inviting villa rental. A freeform swimming pool curves between the gardens and the lounging pavilion. Regal pillars and archways lead into the pavilion’s cushioned seating, barbecue grill, and dining nooks. Travertine tiles surround the outdoor shower, and terra cotta decking leads to the al fresco dining table in the gardens. Wrought iron gates lead into the front courtyard, which is enclosed on all sides and opens to the sun-drenched sky. The courtyard and lounging pavilion both connect to the living and dining room. Plush seating, an entertainment system, and dining for six are gathered into one space. Large archways lead into the gourmet kitchen, which offers a spacious design, stainless steel appliances, and a breakfast bar. The kitchen is just off the laundry room and garage. All the common areas and bedrooms in the main house are air-conditioned. The main house’s three bedrooms each have a spacious layout, an ensuite bathroom, and a flatscreen TV. The first suite features a king bed, garden views, and a glass-enclosed shower. The second suite offers a queen bed, a loft with two twin beds, a walk-in closet, and a glass-enclosed shower. The third suite has a four-poster king bed, a walk-in closet, a Jacuzzi tub and a walk-in shower, and access to the pool deck. The guest house offers independence and privacy from the main house without being totally isolated. Its entrance is on the side of the villa, and it has a studio design. A dining table, kitchenette, and flatscreen TV are at the front, and a queen bed and floor-to-ceiling armoire sit at the back. Its ensuite bathroom has a glass-enclosed shower. Each of the arched windows face the gardens. Casa Campana is in the Eco Golf community in Los Suenos. Los Suenos offers water sports, restaurants, fishing, and supermarkets. Casa Campana has a great location for families who want to be near activity but far from the crowds. Bedroom 3: To story layout with Queen bed downstairs and 2 twins located in the mezzanine. The beach is an approximate 3 minute drive to the Beach Club / Playa Herradura Beach.